Why would you spend a lifetime learning to build furniture by hand, when machine-made furniture is perfectly adequate? For master furniture craftsman Gary Rogowski, the answer is that the discipline of working with one’s hands to create unnecessarily beautiful things shapes the builder into a more complete human being. In the tradition of “Zen and the Art of Motorcycle Maintenance” and “Shop Class as Soulcraft,” Rogowski’s “Handmade” is a profound meditation on the eternal value of manual work, creativity, human fallibility, and the stubborn pursuit of quality work. Rogowski tells his life story of how he became a craftsman and how years of persistent work have taught him patience, resilience, tolerance for failure, and a love of pursuing beauty and mastery for its own sake. Part autobiography, part guide to creativity, and part guide to living, “Handmade” is a book for craftspeople, artists, and anyone who seeks clarity, purpose, and creativity in their work … and the perfect antidote to a modern world that thinks human labor is obsolete. A compendium, with more than five hundred full-color illustrations, of the best modern furniture from the Nordic countries. The five countries known collectively as Scandinavia were the source of some of the most important furniture designs of the twentieth century and the influential concept of “Scandinavian modern.” Today, a new generation of designers continues the tradition, creating pieces that are functional, comfortable, and appealing to look at. This book—the first American summary of modern design in Denmark, Finland, Iceland, Norway, and Sweden in more than two decades—updates the history of design in the Nordic nations and illustrates in full color more than five hundred of the best current furniture from over seventy producers. The Sourcebook also includes detailed product specifications and sources, biographies of important Nordic designers, and a helpful bibliography. It is an invaluable reference for everyone who loves modern furniture, and is an essential tool for interior designers, architects, collectors, and students with a special interest in Scandinavian design. CD-ROM included: easy-to-use screen resolution files of all the illustrations for use on Mac or PC. The perfect projects for building your skills. A small box is an ideal woodworking project for anyone looking to gain skills and learn techniques. The resulting box is a true reward for your work: It is elegant and functional, and can make a heartfelt gift. Customize to suit your tastes. In this book, Dennis Zongker gives clear, step-by-step instructions for seven different projects (with variations). 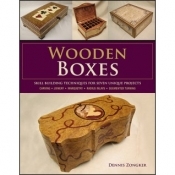 Each project is designed to teach the reader skills that can be applied to a wide variety of box projects as well as to furniture building and other woodworking projects. Satisfying approach to mastering new styles. The boxes featured are traditional in style, with a modern twist, and incorporate a rich variety of woodworking techniques from basic to advanced: •wood selection •joinery (including elongated dovetail joints and lock miters) •carving •veneering •marquetry •segmented turning •routing inlays Bring your projects to the next level. Dennis Zongker, a professional woodworker who teaches classes on carving and marquetry, also includes detailed sections on these topics and how to incorporate them to give these stylish boxes an elegant look that makes them stand out from the field.